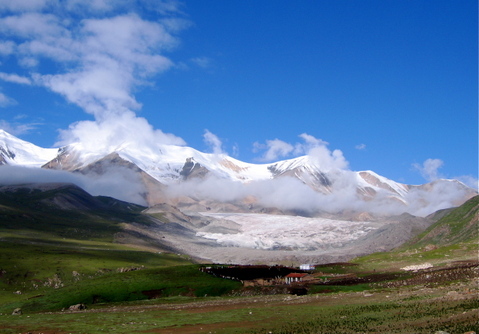 Amnye Machen is one of the four main holy mountains of Tibet along with Kailash, Gongga and Meili Xue. Located in Golog Tibet Autonomous Prefecture (མགོ་ལོག་བོད་རིགས་རང་སྐྱོང་ཁུལ་) in Amdo (ཨ༌མདོ) , it rises to 6282m / 20,605 feet. In 1929, adventure traveler/botanist Joseph Rock incorrectly measured the mountain at over 9000m / 29,520 feet, making it the world's highest mountain for a short time. Later, the mountain was remeasured at its current height. This lesser known holy mountain is equally as important to the Tibetan people as the more well known Mt. Kailash (Gang Rinpoche). Amnye Machen attracts Tibetan pilgrims from all across eastern and northern Tibet (pictured below) during the summer months. 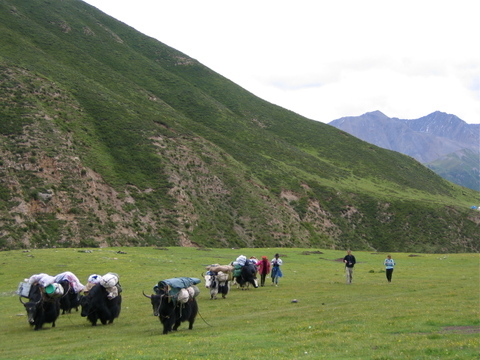 The only people found around the mountain are nomad Tibetans. A trek around the holy mountain normally takes 7 to 10 days. There are many rivers and streams to cross over so having yaks and horses are essential. Most of the trek is above 4600m / 15,090 feet. The best time to do the trek around the mountain is from late June to early September. Even during these months, nights can be very cold and snow is possible. During the winter, the lows can reach -30C making it a bad time to do the trek. Trekking around Amnye Machen can be difficult without having a guide who is familiar with the area. To reach the mountain independently, the launching point is the small town of Machen (known as Dawu in Chinese). From Machen you can hire a vehicle to take you out to Chuwarna (Xue Shan in Chinese). Another option is to take the Xining-Jyekundo highway to the town of Huashixia. From Huashixia a road cuts down to the southeast towards the town of Darlag (known as Dari in Chinese). About 60kms after leaving Huashixia, you will cross a mountain pass with an excellent view of Amnye Machen. For the adventurous, you can get off here and trek on your own around the mountain. This is only recommended if you are familiar with the area and are experienced in high elevation trekking. Patrik....Labrang and Machen are in 2 different provinces. The easiest way is to take the daily bus at 6am from Labrang to Xining. From Xining, there are multiple buses per day to Machen (Dawu). The only people found around the mountain are nomad Tibetans. A trek around the holy mountain normally takes 7 to 10 days. There are many rivers and streams to cross over so having yaks and horses are essential. The nomad Tibetans around the mountain were so kind to our group. I hope to go back again in the future. This place is looking so calm and breathtaking, but I think that the most beautiful and spiritual place for a Pilgrimage is Israel, of course meant mostly to the holy city of Jerusalem. Great Pictures. Thank you for sharing with us ! I have heard lot about Amnye Machen but never gone there. It is looking awesome in these pictures. Let me make my plan with my girl friend. I will surely make plan . A Theatre company has organised an evening of entertainment to help send disabled children on the holiday of a lifetime. The legend of Amnye Machen spans two wildly dissimilar cultures. In the West, it was long rumored to be higher than Mount Everest. absolutely breathtaking. The images are wonderfu, content is wonderful, the subject is wonderful. Well done..What a truly great place. I really like your pictures. The air their looks so crisp and clean. Amnye Machen was the best trip I have ever taken. The scenery was stunning. The nomad Tibetans around the mountain were so kind to our group. I hope to go back again in the future.